I ventured out on a sketch trip across the golf course the other day, armed with necessary supplies packed in a little bag. 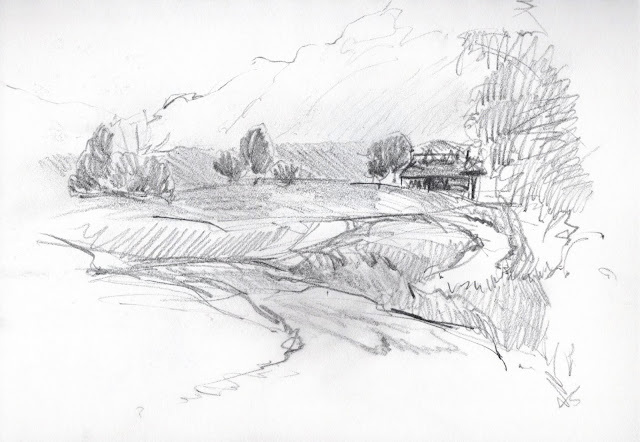 The golf course is a beautiful area to stroll and sketch--an unusual oasis in our arid country--but it can be hard to avoid golfers and find a surreptitious spot. I first found a little bench a half-mile from our house and parked myself there, as it offered a fine view of the course's rolling hills, clubhouse, and local mountain. (Please ignore the smudging--a little bit of it is an experiment gone wrong, but the rest happened with careless handling.) I definitely want to come back to this spot...the mountain adds a beautiful backdrop and the little hills make lots of interesting layers.